John Smith (1655/56–1723) was an English politician, twice serving as Chancellor of the Exchequer. Smith's father was also called John Smith (d. 1690) of South Tedworth or Tidworth in Hampshire and he had a sister called Anne, who became Lady Dashwood. He educated matriculated from St John's College, Oxford, did not take a degree but was admitted to the Middle Temple and first elected a Member of Parliament in 1678. He was a moderate Whig. Smith was first appointed as a Lord of the Treasury in 1694 and as Chancellor on 2 June 1699, serving until 27 March 1701. 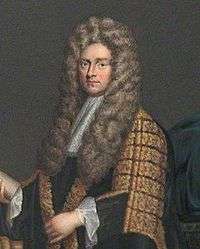 He was Speaker of the House of Commons from 1705 until 1708, returning as Chancellor from 22 April 1708 until 11 August 1710. He was the last Speaker of the House of Commons of England and held this post at the time of the Acts of Union 1707, going on to serve until 1708 as the first Speaker of the new House of Commons of Great Britain. He married Anne, daughter of Sir Thomas Strickland, and had four sons and three daughters, including Mary Smith and Anne Smith, Lady Grant. "SMITH, John (?1655-1723), of South Tidworth, Hants.". History of Parliament Online. Retrieved 17 May 2013. This article incorporates text from a publication now in the public domain: Courtney, William Prideaux (1898). "Smith, John (1655-1723)". In Lee, Sidney. Dictionary of National Biography. 53. London: Smith, Elder & Co.